…And sometimes you do the best you can. | Run, Pegleg, RUN! I ran the 2010 ING NYC Marathon the best I could last Sunday and that’s all my Mom wanted me to do. It’s incredible the way life lessons can finally be learned over a lifetime. It’s taken me 32 years to understand why my Mom was right. And it’s funny that an athletic endeavor really could teach me something that’s worth applying across all aspects of life. Last Sunday, Marathon Day, started at 4:15. Each hour of the night before, I got up to go to the bathroom. Finally the time came to stay up and start preparing. Juno drove me to Park Slope at 5:15 to get on the bus to Staten Island. I met up with my PPTC running buddies and we boarded. After 7 solid months of training, I was finally on the move to actually run this race. The time on Staten Island could have been a lot of things – anxious, tedious, fun – but mostly it was just time. Emotionally, nothing really happened to me. I was prepared, confident, and ready to run. I spent the 3+ hours just watching. Where normally there would be a Coast Guard base, suddenly springs a “camp” for 45,000 runners and the thousands of people volunteering and working. It’s like Burning Man but with far fewer drugs but equally strange attire. Eventually the First Wave ran off and the race proper had begun for some 10,000 people. I made my way towards the orange starting area for my part of the Second Wave, found a sunny spot, and listened to some music with one ear and the world with my other. When corral 33 opened, I entered and waited some more, staying warm in my down parka I brought from the Coop, nestled on a sandbag. People were all around – stressing, jostling, stretching, loosening up. 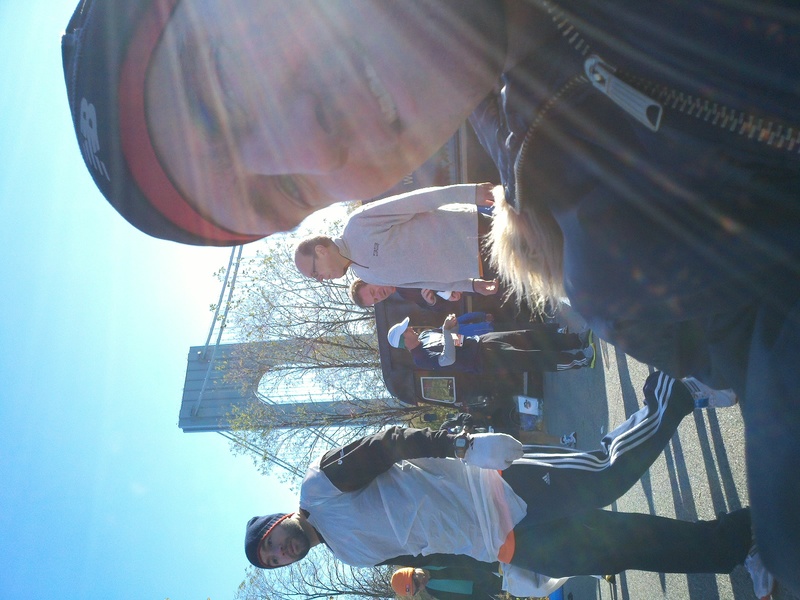 Time ticked by, the ropes rolled up, and we marched to the toll booths for the Verrazano Bridge – the starting line. Without much fanfare that I could see aside from some muffled amplified speaking and maybe a patriotic song, the cannon fired and we had begun. After a minute or so I crossed the starting mat, started my watch, and started my own marathon. The uphill of the bridge to start was crowded and slow. I was running a pace of nearly 9 minute miles. I had anticipated it being slow but not this slow, fearing the hole being dug for me with nothing I could do. To reach my goal of 3:10, I needed to run 7 minute 15 second miles. From the beginning I was going to be more than a minute behind. I did the best I could on that first mile of the bridge, managing an 8:32 mile. On the downhill side, the field opened up, I relaxed and let gravity pull me down, running a 6:20 and was more or less back on pace, but not the way I intended. It was challenging to fall into a rhythm down 4th Avenue after such an up and down start but I settled into a nice 7 to 7:15 pace. Brooklyn is home so Brooklyn was the best. I had lots of energy and lots of fans to cheer me on. Mile 7 was where I knew Juno, my Dad, Aunt Lynnie, Andrew, Maeve, and others would be on the Park Slope side of the street so I crossed over around 15th Street looking forward to 3rd Street and my fan club. Just before the mile marker, I saw a crew from PPTC and got excited. Just past the Mile 7 clock, I saw a crowd of people with signs all cheering for me, and I pulled off to the side and gave Juno a kiss to the delight of everyone around. It was fun. And quick. I took off down 4th Avenue supercharged. I felt a tap on my arm and a friend jumped out of the crowd and ran with me for a few strides – quite a surprise and really nice. Then the race takes the first turn off 4th Avenue and it felt good just to take some curves and change the scenery. In Fort Greene, I looked to my left just in time to see a whole other set of “Run, Pegleg, Run” signs, beautifully and professionally designed and printed by my friend Justine. Next I hoped to see Alejandro and Matias who I thought were going to be on the left side of the street. Just as I looked over, I hear my name and see their smiling faces. It was the best and you can see my happiness in the photo Matias took as he ran alongside me for a few paces. Miles 7 to 9 were the best part of the whole race. Then it was time to lock in and run. And it hit home when reaching Hasidic South Williamsburg. No one is out along Bedford Avenue as the road makes a slight incline for the better part of a mile. Things start to feel pretty real here – this isn’t going to be a walk (rather run) in the park. Hipster Williamsburg brought me back but the streets are narrow here, too, so I still had to choice my path carefully, by now certainly catching up to the slower folks from the first wave of runners. The Pulaski Bridge between Brooklyn and Queens marks the half marathon point. Here, being halfway, I started to first wonder if I’d be able to keep this pace. It didn’t help that the slight incline of the bridge cause masses of runners to just walk and the whole group of us compressed. Around now I might have started to have my first doubts that I’d achieve my time goal. Regardless, after seeing my official split times, I did set a personal record for my half-marathon – 1 hour 35 minutes and 3 seconds. I beat my Grete’s Gallop time by 1 second! Queens was quick, not much more than 2 miles. I expected to see Merv & Eileen and the Gang Posse just before the Queensboro Bridge. As it occurred to me that I better start looking for them, who do I see but Dom standing on a stool with a giant Pegleg sign held over his head – a perfect, most hilarious sight. I’d have expected nothing less from this group of fun loving folks. Then comes the fast turn onto the bridge – and a wall of people. It’s just like traffic hitting an incline. Everyone slows down, the spaces between people shrink, and many people just start to walk. We’re crammed into a small set of lanes and I knew it was going to be a challenge to run a 7:15. The hill would have been hard enough on its own, but I think I’d have handled it. I had not anticipated the extra obstacle of the hundreds of runners who weren’t trying to run as fast as I was. I also hadn’t anticipated an annoying, slightly stressful technical meltdown in implementing my race day strategy – on the bottomside of the Queensboro Bridge my watch lost touch with the GPS satellites. This might only have made it difficult to know my pace for those specific miles and not have hindered my keeping track of the rest of the race except that the watch suddenly though that I’d actually stopped running altogether therefore paused itself. Now my elapsed time would not be accurate either. This all might sound esoteric, nerdy, and unimportant, but keeping track of these things was big way for me to motivate my pace. It’s quite easy to slow by a few seconds and not realize it. Because I hadn’t built in any cushion, I couldn’t lose even a few seconds if I was going to achieve my goal. The clocks along the course didn’t help me because they keep time for the First Wave of runners. I couldn’t just subtract 30 minutes because I didn’t cross the starting line immediately when the cannon shot either. Suddenly, Adm. Pegleg was driving a ship without a rudder! Knowing I probably had time to make up, I tried to use the hill coming down the 59th Street Bridge into Manhattan to raise my pace. The sharp turns and the bottleneck onto 1st Avenue didn’t help, though. 1st Avenue wide expanse opens in front of me and so begins the tough 4 mile run after what was supposed to be an easy 16 miler. Then a grueling 10K awaits. Here is where it starts to get emotional. It’s getting harder to keep my pace at 7:15 and I’ve no idea how much time I lost on the bridge. I don’t know how hard I have to push to get back my lost time yet I know there’s still so much race ahead of me. I can’t trust any of the information on my gadgets with the satellites signals bouncing off all the buildings as much as my watch. According to my watch, I go from a 5 minute mile pace to a 20 minute pace back to 5 minute pace in 20 seconds. And I’m annoyed that technology is bothering me at all when I should be running for fun and driven by my own motivation. Most of all, I start to consider that I might fail. Fail for me doesn’t mean not finish. At this point of the race, failure meant finishing slower than 3:10:59. I realized usually I don’t set goals I can’t achieve and I certainly don’t make them public. Going through my mind was: Now I’ve done that. Everyone knows what I set out to do and is counting on me to do it. And I don’t think I can do it. I can’t let everyone down, though. I have to try. I was motivated and I kept my pace high, as fast as I could go. Since I knew I couldn’t trust my GPS anymore, though, I let it go. And it was a relief. The anchor of checking my time constantly was cut. Now I could just run with the attitude of possibly not reaching my goal and I wouldn’t be able to keep track of how far behind I really was. Even though I thought I’d fallen irreparably behind, I still tried to keep my 7:15 pace. Around Mile 19, though, I seemed to be falling closer to 7:30. The mile through the Bronx was a blur. The crowds were fun, but I was upset at what I saw happening to me. Each mile I was losing 15 seconds and I only had 59 seconds to spare above the 3 hours and 10 minutes a 7:15 pace could get me. I didn’t know I what I had lost on the bridge. The reality was sinking in – I was going to fail. I came back to Manhattan for that final, difficult 10K still ahead of me thinking I was in the midst of failing, of letting down the hundreds of supporters I was running for, and making myself look foolish. Also, all the while as these troubling thoughts troubled me, I knew I was being crazy. Crazy because I was still running a great race. Crazy because I was in the best shape of my life. Crazy because I knew I was happy to be running at all. I ran past Juno, my Dad, my Brother and other family and friends at 125th Street shaking my head but with a smile. So feelings of failure became more “fake” feeling of failure – like I knew I was going to fail in everyone else’s eyes and to the world in general but it didn’t really bother me. I knew I was trying. I knew I had taken a risk in telling people my goal. But I was going to be ok.
More troubling, then, became the pressure of my story, this blog, and my speech for the Gilda’s Club Gala. I’d lost my poetic, heroic ending. I needed to qualify for the Boston Marathon for me so I could go back to that place 5 years later and honor my Mom. In 10 days I was going to be standing in front of 250 people in gowns and tuxedos in a hotel ballroom 30 blocks from where I was running at that very moment and I wasn’t going to have a story to tell. I wouldn’t be able to talk about the marathon because I was going to be embarrassed. I was going to be ashamed. I’d let my Mom down. I wasn’t going to go to Boston. I wasn’t going to be able to run just for me and just for her. I tried to dig down and pick up my pace. Central Park was on my right. The crowds were crowding the street. We only had one lane to run in and the people were slowing down on the 5th Avenue Hill. Everything was aligned against me reaching my goal. But I still take one last look at my watch and think, “If I can run these last miles at a 6 minute pace, I can make it!” So I pull out my trump card: Run for MOM. Do not let her down. Show her how much you love her like you didn’t enough when she was alive. Run. I’ve got enough in me to surge for a moment as I make my turn into Central Park. I think, “Mom – what would she say if she were here now?”And suddenly I’m struck with waves of thoughts. They happen in an instant but they’re so full. There’s no way I can run a 6 minute pace now. There’s no way I can finish in 3 hours and 10 minutes. There’s no way to reach my goal. And Mom says, “All that matters is that you try your best.” And I say, “I’m trying my best!” For the first time in my life, I know what she means and I know she’s right. A huge smile breaks onto my face as I run through Central Park. Any heaviness, any doubts I had, any thoughts of failure lifted completely. I was running. I was running for my Mom. I was running for all my supporters. I was running for Gilda’s Club. And I was running my best. And that’s the best I can do. And it’s awesome! From that point on, I think I forgot to race. Too many miles had gone by, too much emotion. I probably physically passed 10,000 other runners and I couldn’t weave through them anymore. The world became cinematic. Time and movement happened on a different plane. I was seeing in tunnel vision. I was seeing in frames. I remember a person collapsing to my right and thinking, “Whoa, I still might not make it.” I pushed on. Turns out I ran those last 2 miles in 8:30 and 9 minutes. It didn’t matter anymore. I knew I was trying my best. I knew I was doing my best. I knew my Mom would be proud. I knew everyone else would be proud. For me, most of all, I knew I would be proud of me, too. Thanks for the lesson, Mom. Finally, I learned it. I ran the NYC Marathon in 3 hours 16 minutes and 36 seconds – a pace of 7 minutes and 30 seconds per mile. I ran the NYC Marathon on November 7, 2010 the best that I could. I ran the NYC Marathon for my Mom. I won. This was a great account of your race. From the technical annoyances to the realization. It’s really hard to give up a goal and still keep pushing, which is what you did. Congratulations!